G&M Services offers concrete cutting services to clients throughout Maryland, D.C., Baltimore, Virginia, and Pennsylvania. 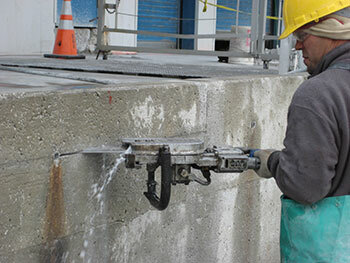 By combining the concrete cutting services of G&M with the firestop installation services of FireStop and the concrete scanning services of Concrete Visions, we are able to offer comprehensive concrete services that result in a more efficient workflow on the job site. With a staff that has more than 25 years of experience in the industry, you can trust G&M Services to cover any and all of your concrete cutting needs. G&M Services, LLC was formally established in 1999, and from the start we have worked to build long-term relationships with our clients, devise unique solutions to meet their needs, and perform quality work at a fair price. Thanks to the repeat business and recommendations of our many loyal customers, G&M Services has continued to grow in size and scope. Site Visit – When you contact G&M Services regarding concrete sawing and drilling, we begin by scheduling a site visit to discuss the project and advise you on the best possible solutions, for safety and cost. Estimate – Our pricing may not always be the cheapest, but it reflects the level of safety and quality needed to complete the project correctly. Scheduling – We begin the project on an agreed date. Our highly-trained and knowledgeable field mechanics are briefed regarding the project and are given a copy of the site visit and plan. Completion – When the project is completed, the client signs off on the work order. We ask our clients to complete a customer feedback form, to help us constantly improve our service.